LAWRENCE — The Spencer Museum of Art invites viewers to contemplate the past, present and future with the exhibition “Temporal Turn: Art and Speculation in Contemporary Asia,” which opens today. This major international exhibition at the University of Kansas features 26 contemporary artists from across Asia whose work explores ideas about time, history and memory. In addition to works from the museum’s permanent collection, “Temporal Turn” includes international loans and site-specific commissions by four artists-in-residence. All four artists will give a gallery talk from 2 to 4 p.m. Friday, Nov. 11, at the museum. Organized by Kris Ercums, Spencer Museum curator of global contemporary and Asian art, the exhibition addresses a range of issues, such as our ongoing relationship with technology, climate change, globalization, and changing attitudes toward gender and national identity. The speculative focus of the exhibition is organized around five themes. "Pulse" presents artwork that investigates biological systems such as physiology and evolution. "The Edge of Infinity" examines the role of mathematics, astronomy and space exploration. "Mythopoeia" explores historical and mythical fictions grounded in culturally specific perspectives. "Human/Posthuman/Inhuman" ranges from predictions about the next step in human evolution to extraterrestrial life. The final theme, "Anthropocene," contemplates how humans are transforming nature on a planetary scale. Artists-in-residence Konoike Tomoko (Japan), Rohini Devasher (India), Park Jaeyoung (Korea) and Sahej Rahal (India) worked at the Spencer Museum during October and November to create new art for the exhibition. Konoike painted a mythical map of Kansas on cowhide and installed versions of her sculpture “Inter-traveller” around the KU campus, including in the Natural History Museum panorama and a tree in Marvin Grove. 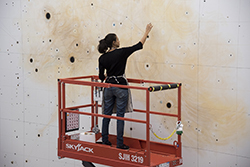 Devasher created a large-scale wall drawing of a star chart with video projections in the newly renovated Central Court. Based on his previous work about the imagined “Bokaisen” creature, Park installed a laboratory to research the elusive “Kansas Bokaisen,” an animal inspired by the bison, cottontail rabbit and the fictitious jackalope. Using found objects in Lawrence, Rahal created monumental sculptures in front of the museum that appear as futuristic ruins representing the city’s history. Gallery talks, film screenings and art activities will further engage the public with the curious and inventive ideas presented in “Temporal Turn.” The show runs through March 12, 2017. Major support for this exhibition was provided by the Andy Warhol Foundation for the Visual Arts, the National Endowment for the Arts, the E. Rhodes and Leona B. Carpenter Foundation, the Asian Cultural Council and the Japan Foundation. Friday, Nov. 11, 2-4 p.m.
Spencer Museum of Art, 1301 Mississippi St.
Join international artists-in-residence Rohini Devasher (India), Konoike Tomoko (Japan), Park Jaeyoung (Korea) and Sahej Rahal (India) for a discussion about their ideas and experiences bringing ambitious new works of art to life for the exhibition "Temporal Turn: Art & Speculation in Contemporary Asia." Wednesday, Nov. 16, 5:30-7:30 p.m.
Budig 130, 1455 Jayhawk Blvd. In conjunction with the exhibition "Temporal Turn," the Spencer Museum is screening Ridley Scott's final cut version of the sci-fi classic "Blade Runner." Exhibition Curator Kris Ercums will introduce the film. The film will be shown in Budig Hall on the KU Lawrence campus and is free and open to the public. Wednesday, Nov. 30, 6-7 p.m.
Delve into “Temporal Turn” with Curator Kris Ercums and discuss varied projections about our history and future world. Intimate and informal, Up Close gallery talks reveal the personal stories behind exhibitions. 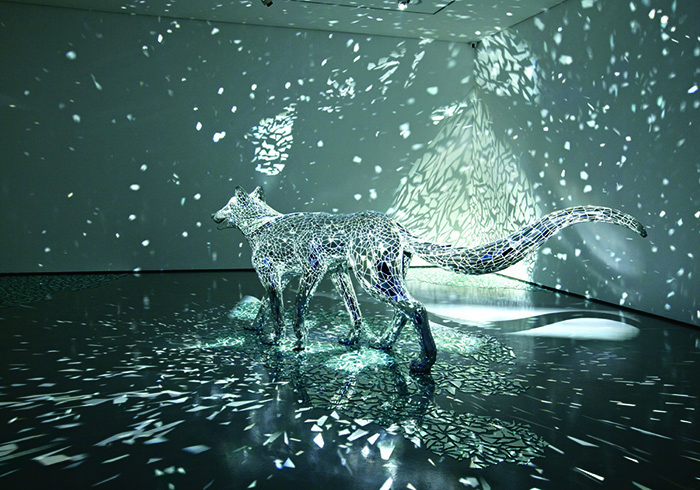 Konoike Tomoko, "Donning Animal Skins and Braided Grass," 2011, mixed media. Courtesy of the artist and Volcanoise, Tokyo. Du Kun, "Golden Bowl," 2010, oil on canvas. Courtesy of the artist and Fu Mude, Beijing. 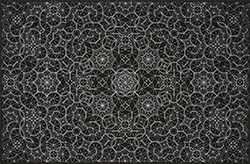 Timo Nasseri, "One and One #35," 2014, white ink on black paper, Museum purchase: R. Charles and Mary Margaret Clevenger Art Acquisition Fund, Spencer Museum of Art.